Versatility. Durability. Reliability. These are three characteristics that are top of mind for any small business, but especially so when it comes to choosing a vehicle that will help you to get the job done on budget and on schedule. It’s for these very characteristics that KIA’s K-Series of light commercial vehicles, available in K2700 and turbocharged K2500 guise, has become one of the most popular workhorses across the globe, and especially in South Africa, over the past decade. Hardworking, practical, durable and reliable, the K-Series makes it easier than ever to get back to business. Living up to the Korean automaker’s brand slogan, “The power to surprise”, the KIA K-Series has several aces up its beefy sleeves. The K2700, for example, not only offers small businesses a notable cost-per-kilometre advantage over conventional one-ton bakkies, but also a larger, 1,3-ton payload – a seemingly small advantage, but one that makes a big difference when transporting crucial building and construction supplies. But the K2700 doesn’t just offer durability with its large payload; it also offers exceptional practicality thanks to its large, flat 4,73m² load bay. With a length of almost three metres (2 810mm) and just over 1,5 metres wide (1 630mm), the K2700 puts the power in your hands with regards to what can be transported, and how it’s transported. Adding even more flexibility, is the K-Series’ various body types. Available as a drop-side, a tipper and a chassis-cab, with single or dual wheels on the rear axle, it’s also extremely easy to customise the K2700 and K2500 to fit your business’s unique requirements, regardless of whether you are transporting bricks, cement or a ton of sand. Powered by KIA’s trusted and proven 2,7-litre diesel engine, mated to a five-speed manual transmission, the K2700 is also powerful enough to haul any load without sacrificing on fuel economy or affecting overall maintenance expenses. Yet the K-Series’ biggest ace is its industry-leading five-year, unlimited kilometre warranty – undeniable proof of the faith KIA Motors has in its products. Also included is a three-year, 60 000km service plan and five years of unlimited roadside assistance. For more information, visit www.kia.co.za or your nearest KIA dealership. Fleet owners can also join the KIA Fleet club at www.kiafleet.co.za for preferential rates, corporate rebates and priority service. 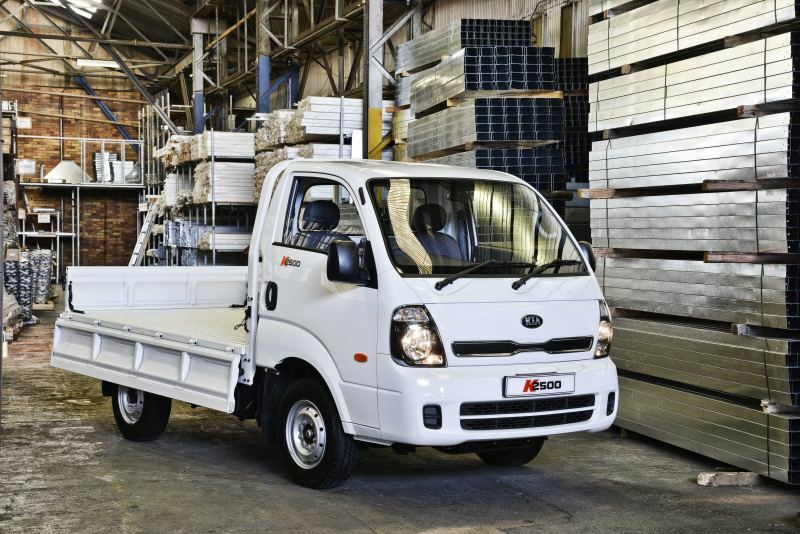 Captions Main Image: The KIA K2500 is easy to customise to fit a business’s unique requirements.